I am so fortunate to talk in-depth with Marissa Slaven about her background and her debut novel Code Blue, which comes out on Earth Day this year and will be available for pre-order near the end of January. Marissa is a mother, daughter, sister, palliative care doctor, blogger, podcaster, and author. She says that she has always loved reading and would devour any books she could get her hands on as a teenager. When it came to school though, she was a serious science nerd. As a grown-up, even when she had almost no money, she never denied herself books. She notes on her blog that she was lucky enough to go to Paris a few years ago, but had terrible jet lag and couldn’t sleep. Somehow a story came to her, and she started to write. Before she knew it, she had written a novella. So then she wrote some more, and her writing became her happy place–somewhere she could escape to after the kids were all in bed. Over the next few years she was lucky to have professional help from the wonderful people at Humber College and the undying support of her family, including her daughter Anna, who inspired her soon-to-be-released first novel Code Blue. Dystopian fiction comes and goes, and too many assume the trappings of formula productions; but the test of any superior story line lies in its ability to draw readers with powerful characterization and associations that lend to a reader’s emotional connections with events as they unfold. 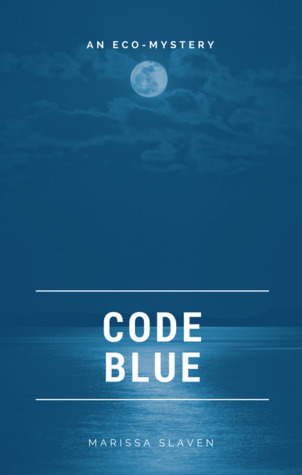 Code Blue holds a special ability to juxtapose both the bigger ecological picture with the microcosm of a young adult’s personal challenges as she moves through this world. Mary: You styled Code Blue very uniquely, structuring it with exam questions about climate change in a futuristic world–with the protagonist being a likeable young adult named Atlantic (Tic) Brewer. How did you get inspired to write this novel? Marissa: I was inspired to write Code Blue for my daughter Anna. She has always loved reading, and she and I were sharing dystopian books with strong female protagonists. I was happy that there were so many examples of girls saving the world. I kept looking for one in the mainstream market who saved the world not because she was brave, or could shoot arrows or jump off trains, but because she was smart. One day I decided that I would try to write one. Once I get an idea for a story, I get lost in it. I keep thinking about it. I can’t stop thinking about it. I keep seeing it play out like a movie, and I just want to get it down on paper. I guess I have an over-active imagination. Mary: I think it’s interesting that you are a palliative care physician. The work you do with patients in crisis may be similar to the novel you wrote, which in a sense also may try to comfort humanity in crisis. What do you think about that? I mean, not all is smooth riding or comfortable in Code Blue–things are incredibly tough for Tic–but the comfort seems to lie in the fact the novel empowers us in a way as we get inspired by Tic to do great things as ordinary people. Marissa: There are many parallels and overlapping themes between my palliative care work and the novel. In palliative care we acknowledge the very difficult fact of someone’s mortality. It is only through acknowledging this that we are able to help them and their loved ones. With the climate change crisis, the first step is also facing reality. In Code Blue the world has accepted that the “Change” is both very real and a very serious threat to humanity. There is often a fear that faced with such grim realities, people will lose hope. I have seen in palliative care that this is not the case. Beyond hoping for a long life, people have many other hopes, most often centered around preservation of dignity and love. Faced with an ever worsening climate situation, the characters in Code Blue do not lose hope but rather work together to try to achieve the best possible outcome for all of humanity. Mary: I feel that this novel was refreshing and hopeful, because we have a likeable yet somewhat vulnerable young woman going through similar growing pains as modern day teens/young adults would–such as romantic uncertainty, concerns about family, and worries about the world. And, as in contemporary society, this young woman also faces big worries about global warming–only, in her time, it’s much worse than now. Despite this, she struggles to figure things out in an apocalyptic place surrounding her. Your novel maneuvers our biggest environmental crisis into a palpable understanding of the human condition within planetary risk, and does well at that. I see you on Twitter posting the hashtag #climatehope. How important is it tell these stories in fiction, and, talking more about hope, how do you think people can find hope in the constant despair around us? Marissa: I believe Thomas King was right when he said “The truth about stories is, that’s all we are.” Whether the issue is climate change, as it is in Code Blue, or something else altogether, like socio-political issues ( 1984 or The Handmaid’s Tale), I think that stories connect us to our worries in a deep visceral way. Facts and statistics are important, but so much of what motivates people to action occurs at an emotional level, and I suppose it is this I am trying to connect with. Naomi Klein, author of This Changes Everything, also talks about the importance of stories as they relate to climate change. She says that since the industrial revolution we have been telling a story of the planet as a machine that we can master and how this story has led to our current crisis. But she also says we are free to tell ourselves a new story about living in harmony with nature, a story where “no one and nothing gets thrown away”–a story of hope. I have so much hope. I know that terrible things will still happen as a result of climate change and that many people in positions of wealth and power are committed to making things worse. I also know that a lot is happening all over the world right now to adapt and mitigate the effects of climate change. I know that science and technology, and social movements, are growing exponentially. I know we can’t fix everything, but we can fix some things, or at least I hope we can. Mary: Code Blue appeals to all ages, including adults like me. I found it to be refreshing and almost like a friend as I read through it. Maybe we all find parts of ourselves in Tic Brewer. Is there a part of yourself in her? Can you talk some about how you created her? Marissa: Right away I knew that I wanted Tic to be accessible. I wanted readers to think that the girl saving the world from climate change could be them. I didn’t want her to be a super-genius, and I couldn’t figure out how I could write a character who was smarter than I am. I definitely share some traits and experiences with Tic and am also very different from her in other ways. Tic has an automatic reflex to try to help others, and I think that stems from my own deeply held belief that helping others is what makes my life meaningful. I was able to draw on some of my memories of being a teenager. Like Tic I went to a small high school and often didn’t find myself challenged by the curriculum. I didn’t have lots of friends at school but wasn’t especially concerned with that. I also had three teens of my own while writing the book and found that helpful in terms of trying to keep things real. I think it wasn’t until after I finished writing Code Blue though that I realized that one of Tic’s defining issues is her absent father. My father, for whom I had great respect, was not physically absent as hers is. Nonetheless, I think there is a part of me that was always striving to find him emotionally and to impress him. Mary: This is your debut novel, and it’s an awesome one at that. You have noted that Ernest Hemingway is one of your inspirations. Can you tell us more, and why? Marissa: Growing up I loved Dickens and Brontë as well as Asimov and Bradbury. I really never read much Hemingway until later and even then had ambivalent feelings about his writing. Hemingway’s characters and stories are a bit macho for my taste, but I have always admired his writing style and found his life as a writer to be fascinating. He was a man of ideas and ideals, who experienced both great pleasure and pain in life. My connection to Hemingway feels personal and also spans countries, continents, and generations. I have outlined a nonfiction book I hope to write that explores this topic in depth. Mary: Which brings me to my next question: Now that your first novel will soon be published, do you have any other ideas churning around for future stories? Marissa: Aside from the nonfiction book on Hemingway, Uncle Joe and Me, I have ideas for a few other novels. I want to write another young adult eco-fiction thriller that explores themes of connections to native cultures and to nature. The heroine, a computer hacker, searches for a missing person who may hold the key to the planet’s future and to her own past. Currently I am working on a sequel to Code Blue. I went to Montana this summer to do volunteer work and both the place and the people were inspirational. They made me realize that I had more ideas, both environmental and personal, I wanted to explore with Tic. Mary: Sounds fascinating. Anything else? Marissa: I believe that eco-fiction is a vitally important genre given the environmental challenges we are facing. We need all sorts of stories right now, stories of darkness and of light, stories that tell us what to be afraid of and stories that give us hope. I know that I still have so much room to grow as a writer, and so much to learn about the craft. I am beyond grateful to my publisher for being willing to take a chance on Code Blue. Mary: Thanks so much, Marissa. I am looking forward to being able to share this book with the world on Earth Day this year! The featured image is of Marissa Slaven and is used with permissions.